These stuffed zucchini boats are packed full of Italian flavor and super easy to make. Made with ground chicken, fresh basil, Italian seasoning and diced tomatoes all stuffed into zucchini boats and topped with mozzarella cheese. These are the perfect weeknight meal! I really love stuffed zucchini boats but haven’t made them in forever. In fact, that last time I made them I think it was the time I made chipotle stuffed zucchini boats for the blog. This time around instead of going for that taco type flavoring I went with a classic Italian favorite – chicken Parmesan. Usually, when you think of chicken Parmesan you think of fried chicken cutlets topped with flavorful red sauce and tons of mozzarella cheese. Well, this is like that but lighter, less fried and fresher. And obviously stuffed into a zucchini. 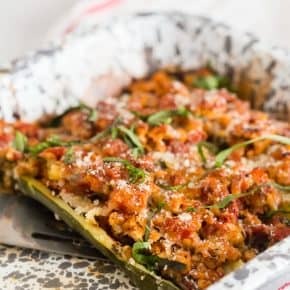 If you’re not in the mood for baked stuffed zucchini boats you can always serve it over zucchini noodles or even pasta. BUT I promise you it’s super easy to stuff these babies. Also, totally off topic but as I write this I’m looking out my window and see nothing but white. It’s windy, it’s snowing and I’m inside my house under an electric window stuffing my face with dill dip and crackers. I guess dill dip is not the normal winter snowstorm food but I’m going with it. Plus this stuff is LEGIT and I cannot get enough of it. I’m going to work on a copycat recipe and get that to you ASAP! 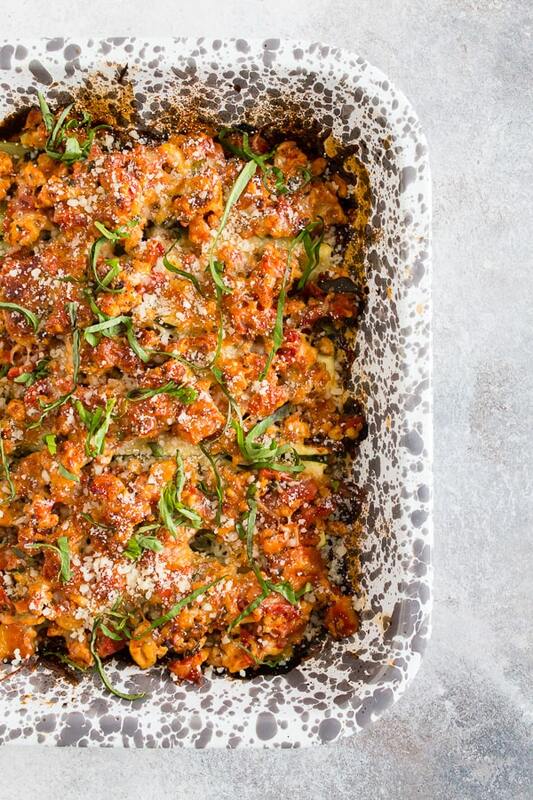 What’s so great about stuffed zucchini boats? It’s such a healthy way to get all your meat and vegetables into your diet. It’s all cooked in one casserole dish and can be stuffed with any stuffing you love. 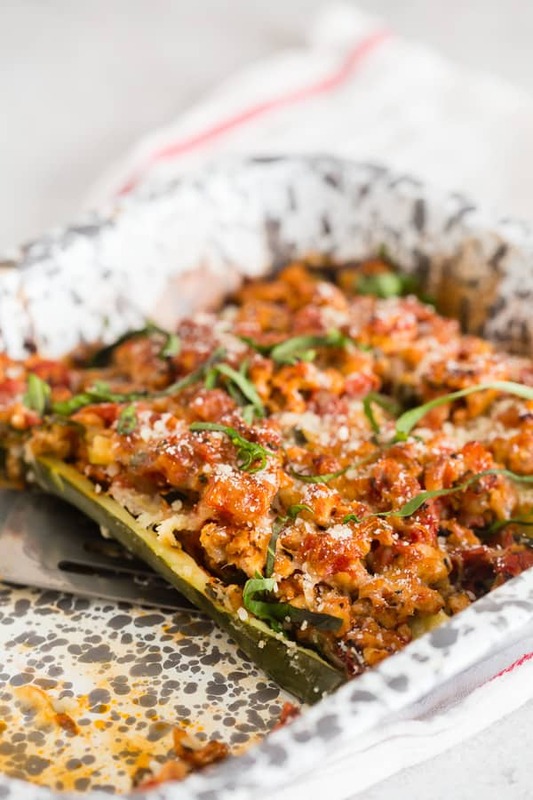 I obviously went to the chicken Parmesan route for these stuffed zucchini boats but you could also do taco, Italian sausage or even garden vegetables. They are so great and easy you’ll want to make to make stuffed zucchini boats all year round! But, back to a recipe I do have on hand – these stuffed boats! Well, stuffed zucchini boats. Not a real boat. That would be weird. Since I didn’t want to waste any of the zucchini I took the inside I scooped out and threw it into the meat stuffing mixture. I figured it was a great way to even sneak some vegetables right into the stuffing. If you want to keep the dish even lighter use less cheese or maybe substitute in some low fat or fat free mozzarella. Love my stuffed zucchini boats? 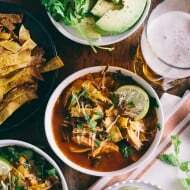 Try some of my other recipes including zucchini: Sweet and Spicy Zucchini Pickles, Greek Zucchini Fritters, Zucchini Corn Feta Pizza, or Zucchini Tomato Kale Pasta. 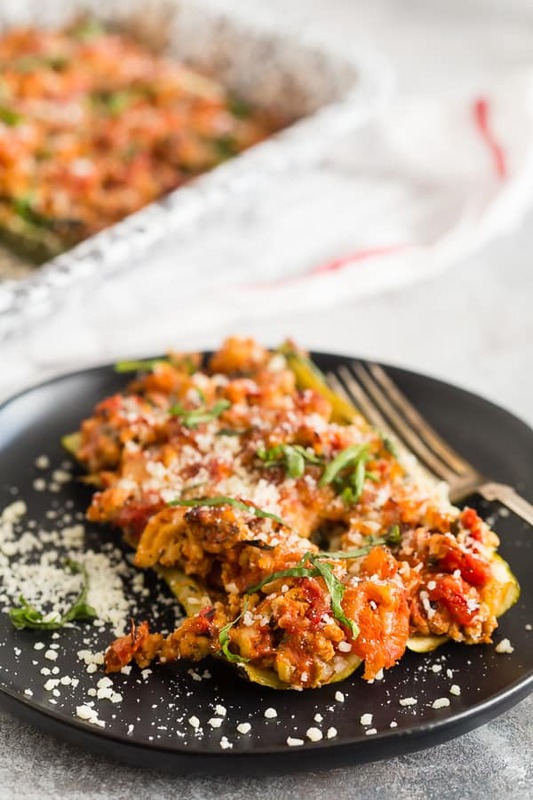 These chicken parmesan stuffed zucchini boats are packed full of Italian flavor and super easy to make. Made with ground chicken, fresh basil, Italian seasoning and diced tomatoes all stuffed into zucchini boats and topped with mozzarella cheese. These are the perfect weeknight meal! Preheat oven to 400 degrees and spray a 9x13 pan with non-stick spray, set aside. Cut the tops off the zucchini and cut lengthwise. Scrape out the seeds and a little bit of the inside squash. Don't throw away the scraped out insides. 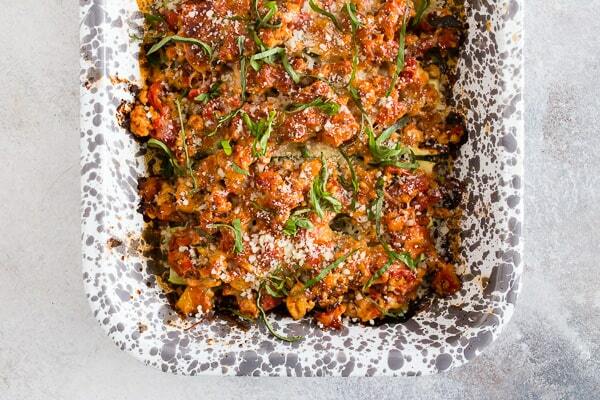 Place the hollowed out zucchini boats into prepared dish and set aside. In a 12-inch skillet set over medium heat add 1 tablespoon olive oil. When the oil is hot add in the ground chicken, Italian seasoning, kosher salt, black pepper and crushed red pepper flakes. 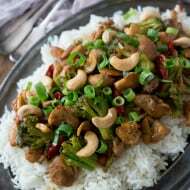 Break up the ground chicken and mix the meat and spices together so everything is equally distributed. Cook for about 5 minutes or until the mixture is no longer pink. Add the garlic and zucchini insides (from when you scraped out the zucchini) and cook for 30 seconds. Pour in the tomatoes, stir and simmer for about 15 minutes or until the mixture has thickened up. You don't want too much water left in the mixture to make sure it's thick enough for stuffing. When it has thickened up stir in the fresh basil. Add an equal amount of filling to each of the zucchini halves and top with the shredded mozzarella cheese and grated Parmesan cheese. Cover the pan with foil, bake for 25 minutes, uncover and bake for another 10 minutes. Such a fun weeknight meal! So much flavor too. Mmm! 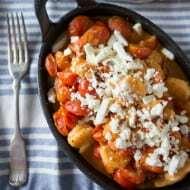 This looks like great comfort food! And I can’t wait for your copycat dill dip recipe 🙂 Stay warm! This is such a great way for me to get more veggies into the kids without a fight. It looks fantastic! These are the kind of meal my kid loves! Such a perfect lightened up combo! Yes please! This is one of my favorite ways to eat zucchini! Wow this looks so hearty and delicious! Perfect comfort food without the guilt!